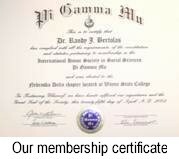 Pi Gamma Mu is a registered 501(c)(3) non-profit organization. Donations may be tax-deductible in the U.S.
Notes: Payment online is by major credit card or Paypal account. Transactions are handled securely at the payment processor site. Pi Gamma Mu does not receive your sensitive financial data. The membership certificate that we present to initiates has a truly elegant and distinguished appearance, suitable for its significant recognition purpose. We publish one of the most attractive and informative newsletters to keep our members informed about events and opportunities. So that all members--students, faculty, and alumni--may access the Pi Gamma Mu Newsletter, we maintain a listserv to which all may subscribe. In terms of amount and quantity, we provide some of the most generous scholarships to our undergraduate members who are advancing to graduate school. We organize a lively convention once every three years, and partially subsidize the travel of many of the delegates. A portion of every initiation fee is set aside as a travel fund for chapter delegates, and many of the students who present papers at conventions receive subsidized lodging in a room in the hotel. We provide lectureship grants, which pay for speakers’ honoraria for chapter events. Providing all of these services and opportunities reflects the tenacity of the officers, the executive director, and the office manager, who have become experts at taking modest amounts of resources and extracting the maximum amount of benefit from them. If you would like to discuss the possibility of establishing a scholarship fund, call our executive director at (620) 221-3128, or send an E-mail message (executivedirector@pigammamu.org). We will happily assist you to establish a scholarship in your name, or in the name of someone whom you would like to honor or memorialize. We gratefully acknowledge those who donated to Pi Gamma Mu during the 2017-2018 fiscal year, which concluded on August 31, 2018. We gratefully acknowledge those who donated to Pi Gamma Mu during the 2016-2017 fiscal year, which concluded on August 31, 2017.